To Cite: Ghaderi-Zefrehi H, Gholami-Fesharaki M, Sharafi H, Sadeghi F, Alavian S M. The Distribution of Hepatitis C Virus Genotypes in Middle Eastern Countries: A Systematic Review and Meta-Analysis, Hepat Mon. 2016 ; 16(9):e40357. doi: 10.5812/hepatmon.40357. Context: The hepatitis C virus (HCV) is classified into seven genotypes and more than 100 subtypes. The treatment regimen, duration and efficacy of HCV therapy may vary according to the HCV genotype. Therefore, the HCV genotype should be determined prior to antiviral therapy. The objective of the current study was to review systematically all studies reporting the distribution of HCV genotypes in the countries that make up the Middle East. Evidence Acquisition: Articles were identified by searching electronic databases, including Scopus, PubMed and Google scholar, with timeline limits (articles published between 1995 and 2016). We carried out a systematic search regarding the distribution of HCV genotypes in Middle Eastern countries. Results: A total of 579 studies were identified by the electronic search. Of these, a total of 187 were identified as eligible papers including 60,319 patients who were meta-analyzed for pooled distribution of HCV genotypes. In Turkey, Israel, Cyprus, and Iran, genotype 1 was the most prevalent HCV genotype with rates of 82% (95% CI, 82%-83%), 68% (95% CI, 67%-69%), 68% (95% CI, 59%-77%), and 55% (95% CI, 54%-55%), respectively. In Egypt, Iraq, Saudi Arabia, and Syria, HCV genotype 4 was the most common genotype with rates of 86% (95% CI, 85%-88%), 60% (95% CI, 56%-64%), 56% (95% CI, 54%-55%), and 57% (95% CI, 54%-61%), respectively. On the basis of adjusted data, HCV genotype 4 was the most prevalent genotype in the Middle East region, with a rate of 74.7% (95% CI, 73.4%-76%), followed by genotype 1 at 15.1% (95% CI, 14.1%-16%). Conclusions: Our results showed that HCV genotype 4 is the most prevalent genotype in the Middle East region. However, HCV genotype 1 is the most prevalent among non-Arab countries in the region including Turkey, Iran, Cyprus, and Israel. The hepatitis C virus (HCV) belongs to the family of Flaviviridae and is the sole member of the genus Hepacivirus (1, 2). Globally, it is estimated that 130 - 150 million people are chronically infected with HCV (3). In humans, HCV causes acute and chronic hepatitis (4) and can progress to more serious diseases including cirrhosis and hepatocellular carcinoma (HCC) (5). HCV strains can be classified into seven genotypes (numbered 1 to 7), each comprising multiple subtypes (e.g., subtype 1a, 1b, and so on) (6). It has been established that genotypes differ from each other by 31% - 33% over the whole viral genome (7). The distribution of HCV genotypes varies in different regions across the world. HCV genotypes 1 and 2 are the most common in North America, Japan, and Europe, whereas HCV genotype 3 is predominant in Southeast Asia and India. HCV genotype 4 is the most common genotype in Middle Eastern countries that include Egypt, Syria, and Saudi Arabia. HCV genotype 5 is seen most commonly in South Africa (4, 8-10). The high genetic diversity of HCV poses an obstacle for vaccine development and effective antiviral therapy (11, 12). Determination of an individual’s HCV genotype is an important issue for the management of HCV infection (13). The treatment regimen and duration, and the response rate to HCV treatment may vary according to the virus genotype. Therefore, the HCV genotype should be determined prior to antiviral therapy (14). The objective of the current study was to carry out a systematic review of all studies reporting the distribution of HCV genotypes in patients from countries in the Middle East. We performed an electronic literature search to identify relevant English-language articles pertaining to the prevalence and distribution of HCV genotypes in Middle Eastern countries. 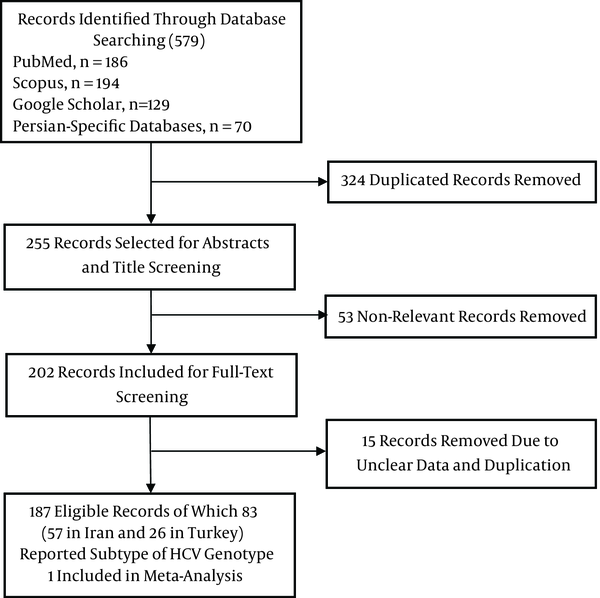 Articles were identified by searching electronic databases, including Scopus, PubMed and Google scholar, with timeline limits (papers published between 1995 and 2016) using different combinations of the following keywords: Hepatitis C virus or HCV, genotypes, epidemiology, distribution, and the names of Middle Eastern countries such as Bahrain, Cyprus, Egypt, Iran, Iraq, Israel, Jordan, Kuwait, Lebanon, Libya, Oman, Palestine, Qatar, Saudi Arabia, Syria, the United Arab Emirates (UAE), and Yemen. Persian-specific databases such as MagIran, Barakat knowledge network system and scientific information database (SID) were also searched with relevant English and Persian keywords. In addition, we did a search on Google scholar to identify any possible existing grey literature and, after finding related titles, we continued our search until we found 200 unrelated serial titles. The references of the retrieved publications were also searched to capture any relevant publications that could have been missed in the initial electronic search. Published studies were eligible for analysis if they met the following criteria: 1, studies with an appropriate study design (cross-sectional, case-control, case-series or cohort study); 2, studies that appeared to include stated information about the distribution of HCV genotypes in Middle Eastern countries; 3, studies with full-text in the English or Persian languages; and 4, studies that used standard genotyping methods, including restriction fragment length polymorphism (RFLP), DNA sequencing, nucleic acid hybridization and type-specific polymerase chain reaction (PCR). The following were regarded as exclusion criteria: 1, studies that did not clearly report HCV genotypes; 2, studies without known sample origins; and 3, studies that failed to explain the data clearly. All articles identified as potentially relevant were reviewed independently by two of the authors (Hossein Ghaderi-Zefrehi and Mohammad Gholami-Fesharaki). They appraised the relevance and the eligibility of each article and abstracted data using Excel data sheets. The following data were extracted from each eligible article: first author’s name, year of publication, the method for HCV genotype assessment, the number of viremic patients, and HCV genotypes and subtypes. Analysis was carried out in accordance with the preferred reporting items for systematic reviews and meta-analysis (PRISMA) (15). The prevalence rate of HCV genotypes and subtypes among patients from each country was computed by metan command. Statistical tests of heterogeneity among the studies were carried out using the Q test (P < 0.10 indicates statistically significant heterogeneity) and I-squared statistics. A forest plot was performed for genotype distribution and subtyping. We also used a funnel plot to investigate publication bias. In this study, the results of the meta-analysis were adjusted with the HCV prevalence rates (16, 17) and the population size of each country (from the last census in 2015, based on UN reporting). For this purpose, population size was multiplied by HCV prevalence. Next, to calculate the number of people infected with various HCV genotypes in each country, the total number of individuals with the HCV antibody in each country was multiplied by the percentage of HCV genotypes in that country. Finally, hierarchical cluster analysis (HCA) with average linkage and a dendrogram plot was used to group the countries by HCV genotypes in such a way that countries in the same group (or cluster) shared a more similar HCV genotype distribution with each other than with those in other groups (or clusters). The analyses were performed using Stata software, version 11 and IBM SPSS statistics, version 22. The study selection process is described in Figure 1. A total of 579 studies (70 Persian and 509 English) potentially related to HCV genotypes in Middle Eastern countries were identified by the electronic search. Of these, 324 duplicates were excluded (31 Persian and 293 English studies). After reviewing the abstracts and titles, 53 (14 Persian and 39 English) studies were excluded based on the stated inclusion and exclusion criteria. After full-text screening, a total of 187 records were identified as eligible papers that had been published between 1995 and 2016. These 187 records consist of 69 studies in Iran, 40 studies in Turkey, 22 studies in Saudi Arabia, 15 studies in Egypt, 9 studies in Iraq and 5 studies in Lebanon. There were three studies available from each of the following countries: Cyprus, Libya, Jordan, Israel, Kuwait, and Bahrain. There were two studies available from each of the following countries:Palestine, UAE, Yemen and Syria. Only one study was found from Qatar and no studies were available from Oman. In the present study, 60,319 patients were meta-analyzed for pooled prevalence of HCV genotypes (Table 1). The populations of the studies were mainly patients with chronic HCV infections such as thalassemia, hemophilia, and hemodialysis patients. Some studies included blood donors, injecting drug users, kidney transplants, and pregnant women. All eligible studies were included according to the country of origin (Table 1). 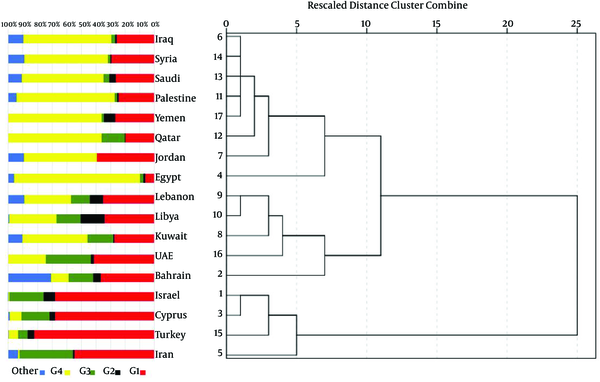 Based on the dendrogram plot (Figure 2), the distribution of HCV genotypes follows two main patterns in the Middle Eastern countries. One pattern is restricted to the non-Arab countries in the region, which include Iran, Turkey, Cyprus, and Israel, in which genotype 1 is prevalent. The distribution pattern of HCV genotypes among Arab countries is also diverse. In Lebanon, Libya, Kuwait, and the UAE, both HCV genotypes 1 and 4 are common, whereas in Iraq, Saudi Arabia, Palestine, Yemen, Qatar, Jordan, and Egypt, HCV genotype 4 is predominant (Figure 2). The pooled mean estimates for the distribution of HCV genotypes in non-Arab Middle Eastern countries (Iran, Turkey, Cyprus, and Israel) are described below (according to the random-effect model). In Iran, HCV genotype 1 was the predominant genotype with a rate of 55% (95% CI, 54%-55%), followed by genotype 3 at 37% (95% CI, 36%-37%). Among patients with HCV genotype 1, subtype 1a was the most predominant subtype with a rate of 79%, followed by subtype 1b at 19%. In addition, 2% were 1a/1b mixed subtypes. In Turkey, HCV genotype 1 was the most prevalent genotype with a rate of 82% (95% CI, 82%-83%). Among patients with HCV genotype 1, subtype 1b was the most common subtype with a rate of 90%, followed by subtype 1a with 9.5%. In Cyprus, genotype 1 was the most frequent genotype with a rate of 68% (95% CI, 59%-77%), followed by genotype 3 at 19% (95% CI, 12%-27%). The most common HCV genotype in Israel was genotype 1, with a rate of 68% (95% CI, 67%-69%), followed by genotype 3 at 23% (95% CI, 23%-24%). Pooled mean estimates for the distribution of HCV genotypes in Middle Eastern Arab countries are described below. In Bahrain, HCV genotype 1 was the most common genotype with a rate of 37% (95% CI, 31%-42%), followed by genotype 3 at 17% (95% CI, 13%-21%). In Iraq, HCV genotype 4 was the most prevalent genotype with a rate of 60% (95% CI, 56%-64%), followed by genotype 1 at 26% (95% CI, 22%-29%). In Jordan, HCV genotype 4 was the most prevalent genotype with a rate of 50% (95% CI, 39%-61%), followed by genotype 1 at 39% (95% CI, 28%-50%). In Kuwait, HCV genotype 4 was the most common genotype with a rate of 45% (95% CI, 38%-52%), followed by genotype 1 at 27% (95% CI, 21%-34%). HCV genotype 4 was the most common genotype in Saudi Arabia with a rate of 56% (95% CI, 54%-58%), followed by genotype 1 at 26% (95% CI, 25%-28%). The predominant HCV genotype in Syria was genotype 4 with a rate of 57% (95% CI, 54%-61%), followed by genotype 1 at 29% (95% CI, 26%-31%). In Yemen, HCV genotype 4 was the most common with a rate of 64% (95% CI, 60%-68%), followed by genotype 1 at 27% (95% CI, 23%-31%). HCV genotype 1 was the most common genotype in Lebanon with a rate of 35% (95% CI, 30%-40%), followed by genotype 4 at 32% (95% CI, 27%-37%). The most common HCV genotype in Palestine was genotype 4 with a rate of 67% (95% CI, 59%-76%), followed by genotype 1 at 24% (95% CI, 17%-32%). The most prevalent HCV genotype in Qatar was genotype 4 with a rate of 64% (95% CI, 59%-69%), followed by genotype 1 at 20% (95% CI, 16%-24%). In Egypt, HCV genotype 4 was the predominant genotype with a rate of 86% (95% CI, 85%-88%), followed by genotype 1 at 6% (95% CI, 5%-7%). In Libya, HCV genotype 1 was the most common with a rate of 34% (95% CI, 33%-36%), followed by genotype 4 at 32% (95% CI, 31%-34%). HCV genotype 1 was the most common genotype in the UAE with a rate of 41% (95% CI, 34%-48%), followed by genotype 3 at 31% (95% CI, 24%-37%). On the basis of adjusted data, HCV genotype 4 was the most prevalent in the Middle East region with a rate of 74.7% (95% CI, 73.4%-76%), followed by genotype 1 at 15.1% (95% CI, 14.1%-16%), genotype 3 at 4.2% (95% CI, 3.6%-4.8%), and genotype 2 at 1.7% (95% CI, 1.3%-2.1%), respectively. Rare genotypes such as 5 and 6, mixed HCV genotypes and genotypes that could not be typed accounted for 4.3% (95% CI, 3.6%-5.7%) of the total number of HCV infections in Middle Eastern countries. The Middle East region is a geographical area that consists mainly of countries in Southwest Asia and parts of North Africa. The prevalence of HCV infection in Middle Eastern countries varies geographically. With the exception of Egypt, the average overall HCV prevalence rate in most countries of the Middle East ranges from 1% - 4%. Egypt has the highest known prevalence rate of HCV globally, with an estimated 14.7% of the total population seropositive for HCV (16, 17). Identifying the geographical distribution of different HCV genotypes is an important factor for epidemiological studies, clinical management, and vaccine development (18, 19). The objective of this systematic review was to establish information about the distribution of HCV genotypes and subtypes in Middle Eastern countries. As shown in Figure 2, HCV genotype distribution follows two main patterns in Middle Eastern countries. HCV genotype 1 was largely predominant in non-Arab Middle Eastern countries such as Turkey (82%), Israel (68%), Cyprus (68%), and Iran (55%). Among these non-Arab countries, subtype 1b was the predominant subtype in Turkey, which is similar to HCV genotype distribution in Eastern and Southern Europe (20). It appears that the predominance of subtype 1b in Turkey originates via virus transmission from Europe, due to Turkey’s geographical position. In Iran, HCV genotype distribution was similar to the situation in North America and north European countries (20), with HCV 1a as the most common subtype. This finding is similar to a previous systematic review conducted on patients with HCV infections in Iran, which reported that subtype 1a was predominant (21). When we look at the countries surrounding Iran, we encounter a high variation in the distribution of HCV genotypes despite their close proximity and even being neighbors. For example, in Turkey, Uzbekistan, and Russia, subtype 1b was common (22); in Pakistan, HCV genotype 3 was the most prevalent (23); and in Saudi Arabia and Iraq, genotype 4 was predominant (24). The difference in the distribution of HCV genotypes and subtypes between Iran and its neighbors may indicate that HCV in Iran originated form a non-neighboring country. In Cyprus, similar to other non-Arab countries, HCV genotype 1 was the most prevalent genotype with a rate of 68%, followed by genotype 3. The HCV genotype pattern in Cyprus is probably related to the transmission of strains from repatriated Cypriots, Cypriots going abroad, and the many travelers who visit the country as tourists (25). The comparison between the distribution of HCV genotypes in different Middle Eastern Arab countries showed that HCV genotype 4 was the most prevalent genotype in most of these countries including Egypt, Palestine, Jordan, Kuwait, Iraq, Yemen, Qatar, Saudi Arabia, and Syria. In other Arab countries, such as Bahrain and the UAE, genotype 1 was frequently reported. The reported prevalence of HCV genotypes in the UAE differed between two available studies. In one study, genotype 4 was the most common genotype (46.2%) among 67 HCV-seropositive patients, followed by genotype 3a (23.8%) (26), whereas in the other study, genotype 1 (49.0%) was predominant among 124 HCV RNA-positive patients, followed by genotype 3 (34.0%) (27). This difference in the distribution of HCV genotypes in the Arab countries of the Middle East may be related to the introduction of the virus by visitors traveling to these countries for business or therapeutic purposes, or because of the limited number of existing studies in most of these Arab countries. In contrast to most of Arab countries in the Middle East, where genotype 4 is the most common, genotype 4 is rarely encountered in the general population in Iran and has only been seen in specific patient populations (28). Mixed infection with multiple HCV genotypes, genotypes that could not be typed due to poor techniques, and rare genotypes such as 5 and 6 accounted for 4.3% of the total number of HCV infections in the countries of the Middle East. Some limitations should be noted in interpreting the results of this study. First, some country data were not included in the review because their original language was not English. Secondly, as no published studies were available about HCV genotype distribution in most countries with regard to high risk groups (e.g., thalassemia and hemophilia patients, as well as hemodialysis patients), we could not estimate pooled HCV genotype distribution among these groups. Thirdly, the studies included in this investigation varied in the HCV genotyping methods and sample size, which may affect the results of the current study. Fourthly, in some countries, available data were restricted to some provinces and could not therefore represent HCV genotype distribution for the whole country. Moreover, the distribution of HCV genotypes may also change over time as a result of war or immigration, which may also affect the results of this meta-analysis. Finally, as no data were available in some countries with regard to the percentage of HCV viremic patients, the results of the meta-analysis were adjusted with the percentage of HCV-seropositive patients. In conclusion, our results showed that HCV genotype 4 predominates in the Middle Eastern countries, although HCV genotype 1 is the most prevalent in non-Arab countries in the region including Turkey, Iran, Cyprus, and Israel. It is important to note that genotypes 1 and 4, the most common genotypes in both the Arab and Non-Arab countries in the region, are associated with a poor response to interferon therapy. The results highlight the need to develop improved strategies in Middle Eastern countries for the successful treatment of HCV infection with newly available antiviral therapies (12). Abbreviations: G1, genotype 1; G2, genotype 2; G3, genotype 3; G4, genotype 4; Other: mixed, untyped, and genotypes 5 and 6; CI: confidence interval.